They’re on the streets and at outdoor markets vending food; they’re parked at classic car shows adding color and interest; they’re spotted in the magazines with famous owners like Matthew McConaughey and Brian Johnson; and they’re all over movies, commercials, TV shows, music videos and Pinterest: It seems that from auctions and concours to museums and festivals, you can’t go anywhere without encountering some sort of vintage camper trailer. And why not? These rolling time capsules represent the convergence of several exploding trends, from the raging popularity of midcentury design and enthusiasm for tiny-house living to the profusion of people seeking to define and personalize themselves with the trappings of the past. Besides, old trailers are just plain cool, and seemingly the perfect accessory to the classic car lifestyle. We admit, we’re more than a little fascinated. We’ve spent quite a bit of time down the rabbit hole looking at trailer photos online, shopping for vintage campers, strolling some of the big rallies, and talking with restorers and owners. We’ve learned that it’s not all s’mores and woodsy fun, but if you go in knowing what you want, what’s available, and what the realities are of living with (and in) an antique camper trailer, you could find yourself realizing your own dream of hitting the road with your house on your back, classic style. Just as dogs and humans evolved together, camper trailers developed alongside and intertwined with the automobile industry. The first “autocampers” arrived in the 1910s in response to the burgeoning ranks of automobile travelers. They were designed to take advantage of the campgrounds springing up around the country that offered overnight accommodations to this new breed of tourist. Most of them were basically tents on rolling platforms that could be towed behind the ubiquitous Model T, but by the late 1920s and early 1930s, manufacturers had started producing more elaborate options, many with evocative names like Prairie Schooner and Roadhome. Outfitted with rudimentary lighting and plumbing systems and built mostly from wood mounted to single- and double-axle frames, these early RVs were short on creature comforts. They were long on charm, though, thanks to their warm, paneled interiors glowing under many coats of varnish and their strong period design elements. Early players in this industry included familiar names from automobile manufacturing, like Brooks Stevens and Pierce Arrow, who constructed small numbers of exquisite (and exquisitely priced) coaches. Airplane designers–guys like Glenn Curtiss and Hawley Bowlus, superintendent of construction on Lindbergh’s Spirit of St. Louis–also got into the trailer game and lent their influence to the rapidly expanding market. By the late 1930s, those primitive wheeled tents had given way to fully finished rolling homes sporting gorgeous art deco details. But the arrival of the Great Depression brought things to a screeching halt. By the time it was over, of the more than 400 companies producing travel trailers in 1936, only a handful remained. 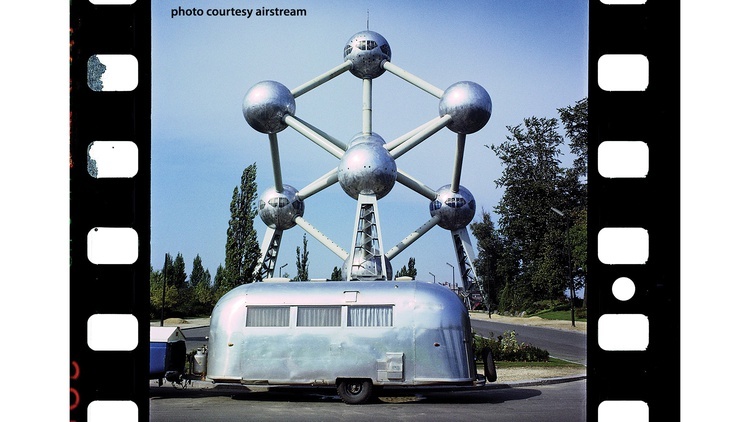 Airstream, Wally Byam’s rechristening of the Bowlus Company, is the only modern survivor–notable enough on its own, but truly remarkable when you consider that Hawley Bowlus’s original, sausage-shaped design has also endured right up to today. The end of WWII brought back both demand and manufacturing capacity, as aircraft makers looking to transition from wartime production started to see RVs as a possible replacement for fighter planes. The arrival of manufacturers like J. Paul Getty’s Spartan Aircraft Company brought airplane construction techniques and materials–especially aluminum–into widespread use, while the postwar need for housing also pushed the industry toward ever-larger sizes and more elaborate layouts. 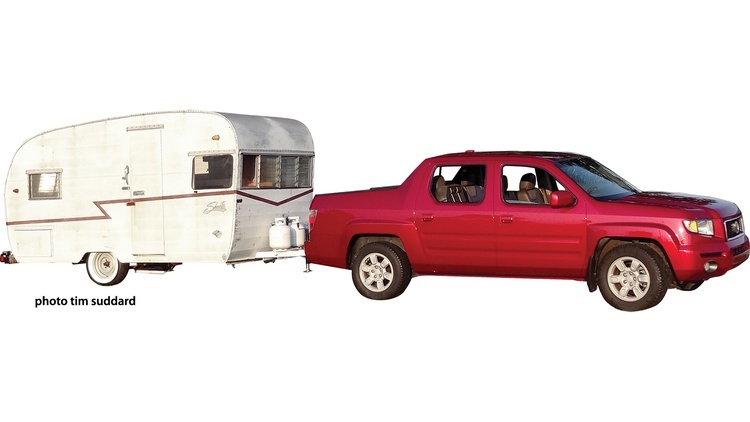 The camper trailer industry exploded alongside this growth toward mobile homes. 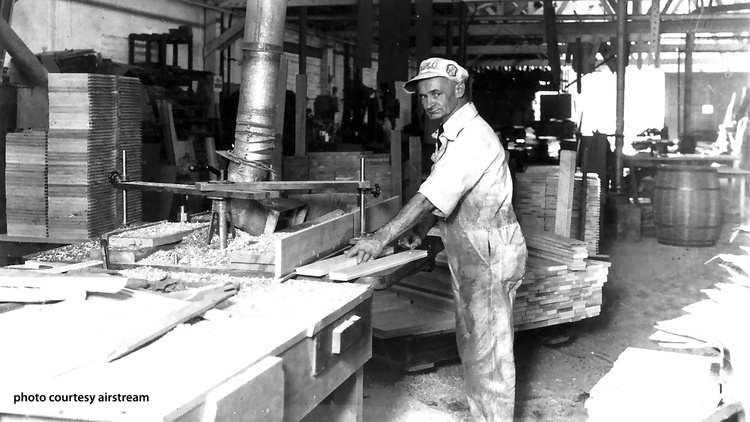 As more manufacturers entered the market, and as the postwar economy continued to boom and boost demand, the aircraft construction principles trickled down into lower price points. Lightweight, stressed-aluminum skins over spare wooden frames began to come to the forefront in a wide range of affordable trailers. What these new, cheaper trailers lacked in expensive materials, they made up for in exuberant design details. Newly arrived laminate materials sporting fun patterns–think boomerangs and daisies–were splashed around their interiors. Outside, their flimsy corrugated aluminum skins were adorned with two-toned paint jobs and, in the case of Shasta, even shiny wings. The social climate was perfect for shaping a new population of customers for these campers. 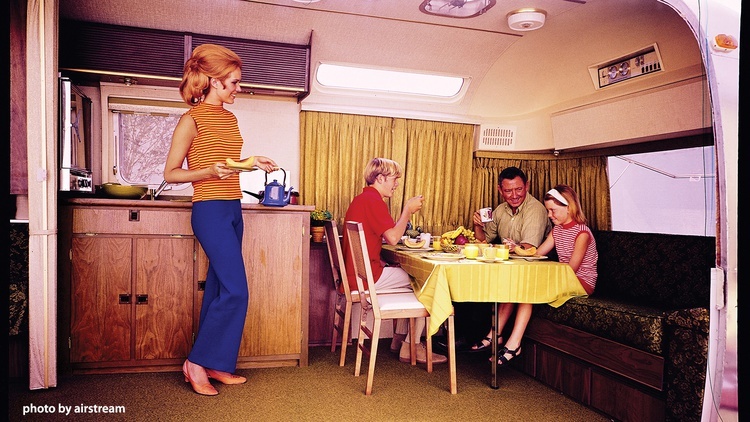 The 1950s ushered in a renewed focus on the nuclear family, and the atomic-age push to develop America’s highway infrastructure (in part so nukes could be moved quickly and efficiently around the country) meant that a lot of those families found it ideal to vacation by car. The RV manufacturing industry rose to meet the demand, and in addition to Shasta and Airstream, brands like Serro Scotty, Aljoa/Aljo, Corvette (produced by the Sterling Company in El Monte, California), Aloha, Holiday Rambler, Terry, Apache, Kenskill, Aristocrat, Boles-Aero, Kit, Eljay and Jewel were just some of the names that rode the rising tide to success by the early 1960s. 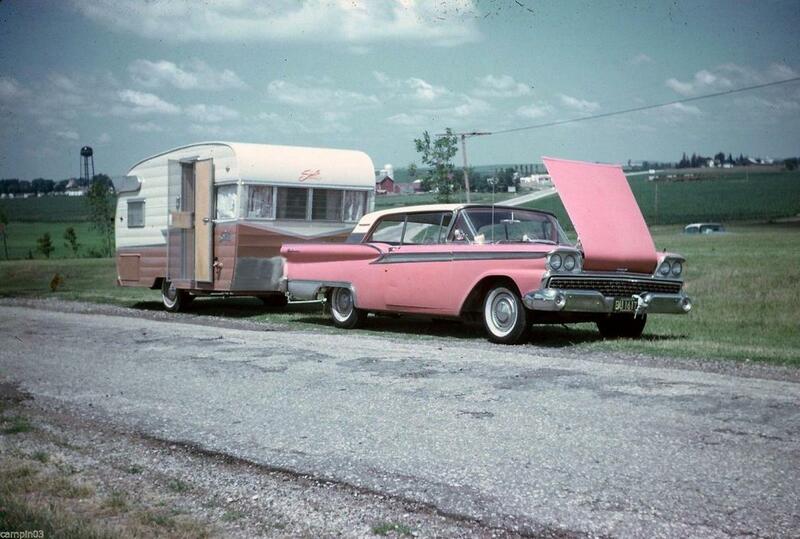 These campers of the 1940s, ’50s and ’60s represent the golden age of vintage trailers. This is when the “canned ham” shape–so named because these campers resemble a tin of ham being towed on its side–became the quintessential exterior. Their iconic interiors featured cozy gas lighting and warm, birch-plywood interiors that complemented the classic midcentury touches. 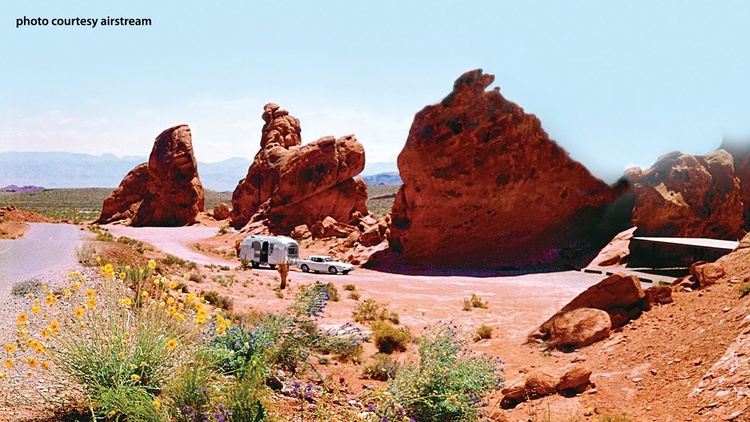 The trailer industry roared into the 1970s at its production peak, and as the popularity of RVing surged, so did the demand for them to have more of the comforts of home. Larger bathrooms with a separate sink and shower began to replace the tiny water closets of yore, starting with luxury-brand campers like Airstreams and finding their way into lower-end offerings. Meanwhile, camping options expanded with the size of fresh- and wastewater tanks. These upgrades came at the price of some of the vintage charm, however, as the varnished wood interiors and gaslights were replaced by printed paneling and 12-volt electric bulbs. 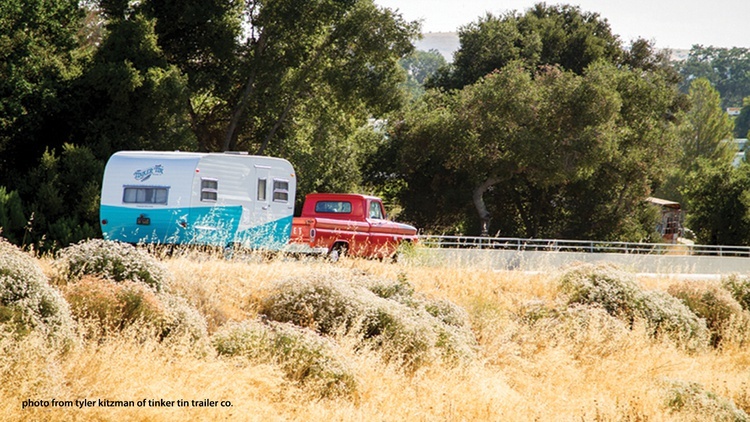 By the early 1970s, camper trailers were a status symbol of the middle class and a common sight on American highways. And then, yet again, the camper industry suffered the same fate as the auto industry: Outside forces blew it into a tailspin. The culprit this time, of course, was the 1973 oil crisis. Americans subjected to long lines at the gas pumps had no interest in hitching a couple thousand extra pounds of aerodynamic drag to their cars–or, for that matter, in taking road trips behind the wheel of most anything capable of towing a trailer. Sales of all RVs plummeted. It was the end of an era. Although it’s been at least 40 years since most of today’s classic campers left the dealer lots, interest in these rolling bits of Americana is at an all-time high. Their appeal is widespread: Baby boomers remember them from their childhoods, and Gen X and Y see them as icons of a simpler, cooler past. Rat-rodders and rockabilly folks hit ’em with their unique design sensibilities, middle-aged ladies dress them up and go “glamping” in the woods on girls’ weekends, and mobile restaurateurs gut them and move into an easy branding statement. Want to stay in a motel composed exclusively of antique camper trailers? Choose your destination, because there are several. 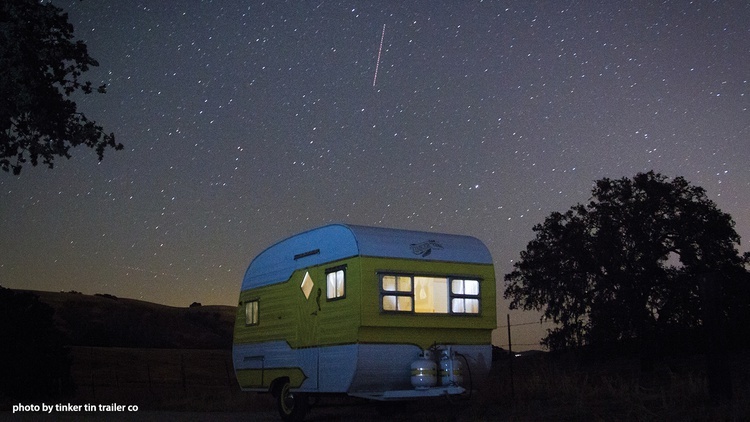 There’s even an area at Burning Man festivals reserved for those camping in vintage trailers. This does not mean every camper you find is ready to hit the road. Although Airstream and Spartan were known for their sturdy aluminum-framed construction, most of these trailers were built with lightness and economy in mind rather than longevity. A lot of the materials simply weren’t intended to last for decades; for instance, the butyl tape used to waterproof the metal skins’ seams has long since hardened and shrunk, leaving these fragile ships vulnerable to the elements. It doesn’t take much water to destroy 1/8-inch plywood and 1x2-inch framing. Nor is every person designed to live in less than 100 square feet of space, especially when they have to share. The original bathrooms in most vintage trailers consisted of a small marine toilet enclosed in a closet too tiny to fit a modern adult male; many of the ceiling heights and bed lengths would also cramp anyone approaching 6 feet tall. And there are other caveats. Modern conveniences were few: Iceboxes were standard into the 1960s, power consisted of just a couple of household circuits that required a plug-in at a campground, and water systems typically stored only a few gallons in tanks pressurized with a bicycle pump (to save the need for electric demand pumps). Outside, the gaily striped awnings were Erector Set projects that required some modicum of scouting skills. And those quaint gaslights did provide some off-grid capacity, but they also heated up the interiors and presented a significant fire hazard. Speaking of off-grid capacity, for many decades, all but the priciest and largest “self-contained” trailers were that in name only. The gray water, which is the non-potty used water, typically ran onto the ground or into a bucket placed under the camper. The toilet, if there was one, typically sat atop a small storage tank that could accommodate only a very limited number of uses. Emptying this black water storage on most classic campers also required some contortions–along with a septic tank repairman’s lack of squeamishness. 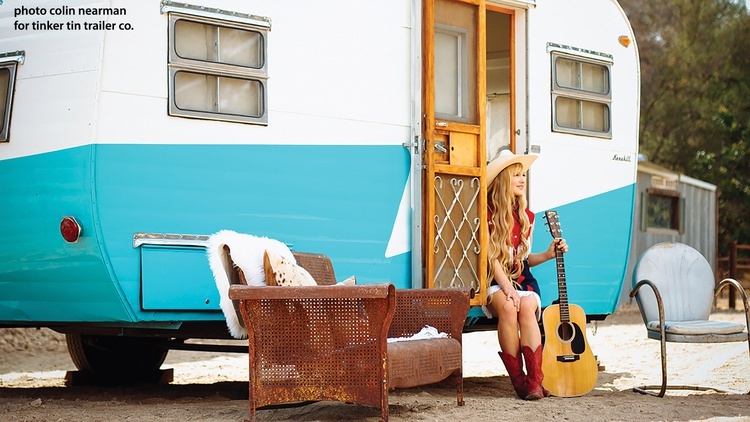 If all of that sounds fabulous to you, you may be a candidate for a vintage camper trailer. Along with the vices and vicissitudes, you’ll also enjoy a ready community of enthusiasts who are eager to share support and restoration tips, not to mention lifestyle and vacation experiences. Since the scene is so varied, shopping for a vintage trailer can be more complicated than looking for a classic car. There’s a lot more to it than setting a budget and choosing how old a coach you’d like to find, since the age and price range will also determine how you can use your trailer. So your first task will be to decide how you intend to use your camper. That way, you can determine which features, like a toilet or a shower, are important to you. This more pragmatic approach can help you avoid the mistake of making an emotional buy on something you adore but will never, ever use. Let’s take that toilet, for example: You may think it’s an unnecessary luxury, but try spending tonight in your bed without getting up, and in the morning gather up all your toiletries, slap on some shoes, and grab a robe before you hit the bathroom–but take a quick lap around the house first. Was that a little too much dancing first thing in the morning? You may not want to overnight in a trailer without a toilet. And if the thought of traveling with your own bodily waste and handling its disposal are abhorrent to you, then you may be looking for the rolling equivalent of a day sailer. Speaking of emotional buys, research is your best tool for avoiding mistakes. “Many people buy without first researching all makes and models,” says Tim Heintz, who owns the vintage trailer specialty firm Heintz Designs. “Most people only know the most popular brands, and they may not fit the individual’s needs as well as another brand of trailer.” Heintz recommends that prospective buyers visit a vintage trailer show or club rally to see a wide variety of trailers before they buy. There are meets scheduled across the country under the auspices of a variety of clubs. The oldest and largest is Tin Can Tourists. Dating back to the very beginning of the hobby, TCT was first organized in 1919 to help promote clean and safe camps, and was known for the soldiered tin can on their cars’ radiator caps. Today they have regions and host rallies across the country, and their website is filled with history, tech, photos, an extensive collection of links to other forums, clubs and stores, and one of the best classified ad sections you can find for vintage trailers. Another great way to research possible purchases is to arrange a stay in a vintage trailer. A quick online search will give you dozens of rental options to choose from spanning the U.S. and Canada–budget about what you’d spend to stay in a boutique hotel. We did just that when we arranged a stay in a little 1959 Terry owned by Tinker Tin Trailer Co. in San Luis Obispo, California. Tinker Tin not only restores, but also rents their trailers set up and ready to camp at a couple of southern California campgrounds. Our stay provided not only a lot of insight into what we wanted in a trailer, but also some invaluable one-on-one time afterward with the owners–Jaime Holm and her husband, Carl. Along with sharing several tips on how to properly disassemble and restore a classic canned ham, they and other experts we spoke with helped direct our search for a rolling home of our own. 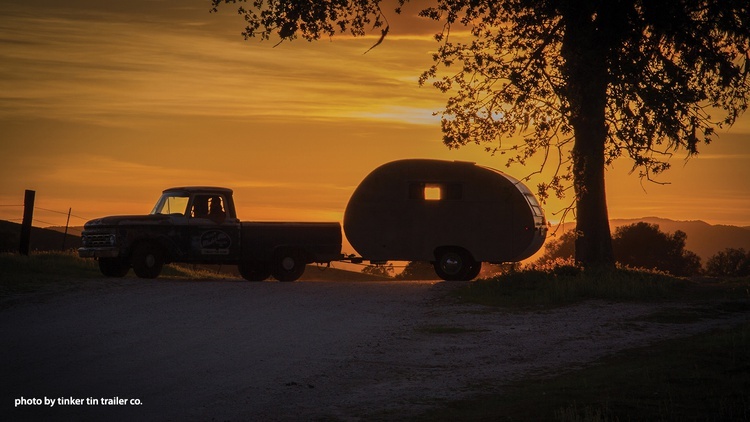 “Only a set amount of trailers were built between the 1930s and early ’60s–the most sought-after years–so the more years that go by, the more valuable these little historic trailers become,” says Tinker Tin’s Jaime Holm. Despite the increasing values, restorations are often far from faithful or period-correct. Customization and personalization are the norms. 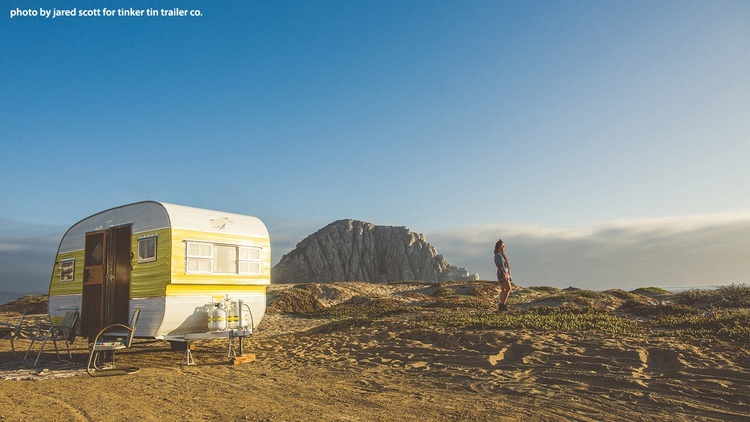 Vintage camper trailers have a tendency to yank at the heartstrings, leading many people to buy them on impulse. Ideally, though, the process takes a cooler head and a more analytical approach. It also takes a few dollars. Interest has been growing, so project trailers that cost less than a grand a few years ago now fetch at least a couple thousand dollars. Figure $15,000 or so buys a nice, restored canned ham trailer, while the most desirable Airstreams start at double that figure. A tip for those shopping: Pass on the national auction sites in favor of local deals and dedicated trailer community websites. All of the experts we spoke with cautioned that the word “restoration” is often used very loosely in the world of vintage camper trailers. “‘Mint condition’ can mean ‘the refrigerator’s 38 years old,’” says Schumann. A quick search online will turn up dozens of “restored” campers that have seen nothing more than a couple of coats of paint to address widespread water damage. And it’s not too hard to find stories of people whose newly purchased “restorations” blew apart or crashed at highway speeds as they were towing them home, either because of unrepaired damage or because they were built beyond the trailer’s weight capacity. There are options available for those who’d like to avoid all of the possible pitfalls that come with owning a 40- or 50-year-old camper. Airstream, Shasta (now a division of RV giant Forest River, Inc.) and Serro Scotty all produce new models in their iconic shapes. The retro Shasta Airflyte 16, a modern replica of the company’s 1961 offering, has a street price in the teens. But for those looking to layer new memories on top of the past, there’s nothing like a vintage camper trailer. We should probably warn you that once you begin researching vintage trailers, you’re likely to end up wanting one. At least, that’s what happened to us. So last summer, we pulled the trigger on this totally unrestored 1961 Shasta 16-SC we found through Craigslist in rural Indiana. We plan to do an “improved original” restoration using period materials and the original layout, but massaged a bit to make the bathroom more modern and usable. We’ll use our trailer at race weekends and shows. In the Navy during the 1960’s I bought a 23 foot Shasta and lived in it whenever I wasn’t at sea. Paid $1500 for it and my rent to park it was $30 month. It had a full rear bath including a bathtub!!!!!! ( shorty but I could almost get my legs stretched out in it! ). 2 single beds that slid together when access to the bathroom wasn’t needed. Plus a full kitchen in the front. Including a gas/ electric refrigerator. Amazing amount of storage and a roll out cabana with full sides that was 16x12 and amounted to the living room. The interior was the full blond wood ( birch) so popular. And Orange shag carpet! Our little 16SC is amazingly roomy inside. Tim's been making great progress on it... I really need to get back on that build thread and relink all my now-obsolete picture links, get in recent developments. We're aiming for an April debut. Been a long road to, you know, the road. Been wondering what happened to that. Was keeping up with it. Spent a some of my youth is an early 60's Shasta before dad moved to an RV. Have a friend local that restored an old camper and regularly uses it. In the late 60’s when my wife and I were married we began camping as I had done with my family since I was a little boy. We had a tent then but would get away on weekends and for summer vacations. After our first child we bought a used pickup camper. It was a Travel Queen on a 3/4 Ton Ford pickup. Travel Queens were rather unique with their rounded roof lines and I think built in California which made them rare in the Midwest. It was a great unit that we put thousands of miles on traveling in the midwest and southeast. As the family grew we eventually bought a Minni Winne motorhome which we also used a lot including an extended trip out west. Our adult kids still talk about the trips and sights from their childhood. We currently have a modern motorhome we use for travel and also attending Motorsports races and events. In our travels I have noticed the interest in vintage campers and it’s always interesting talking to the owners. Also have noticed manufacturers now producing retro looking models. There is also a TV program dedicated to restoring travel trailers named Flipping RV’s. The woodwork is done. The chassis is done. Next it get's wired and insulated and the inside varnished. And then the siding can go back on. How is the bike coming? I will restore both the ladie's and the men's vintage bikes after the trailer is done. I did build a bike rack holder (trailer receiver) into the tailer already. And thanks for fining me that men's bike.